turkey | What's Green with Betsy?!? As we give thanks for family, friends and delicious and abundant food this Thanksgiving, take a moment to appreciate this beautiful earth we live on too. Why not make your Thanksgiving a “green” one and try the ideas below. For your holiday dinner, support local farmers and organic produce. The average food travels 1500 miles from farm to plate, consuming large quantities of fossil fuels and generating major CO2 emissions. Local food by contrast is usually transported 100 – 200 miles, has fewer pesticides and can be picked when ripe. It is obviously fresher and better. Farm stands and supermarkets have an abundance of local winter squash, carrots, potatoes, greens, herbs, apples, and pumpkin. Don’t forget to bring your reusable shopping bags. 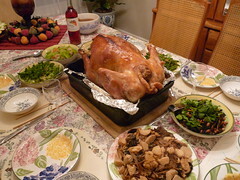 Try a locally grown, free range organic turkey available at local farms and Whole Foods. Fresh turkeys are not treated with antibiotics and growth hormones and are moist and delicious. You won’t believe the difference. For the vegetarians at your table, try a Tofurkey (available from Trader Joe’s). It come with its own vegetarian gravy and is really good! If you can find them, use organic cranberries for your cranberry sauce – cranberries (and other thin-skinned fruits) are grown with a lot of pesticides. Consider serving organic wine along with your meal. Organic wine is made from certified organically grown grapes, meaning grown without pesticides, herbicides and chemical fertilizers. Conventionally grown grapes are another heavily sprayed crop, and the chemical residues can end up in the wine. Organically grown grapes are better for the soil, the plant and the wine drinker. China, silver and cloth napkins are obviously better for the environment than throwaway paper plates and plastic utensils. They look better too! If you are expecting a big crowd and need to opt for disposable, get the biodegradable and compostable plates and utensils. We eat way too many sweets from Halloween through Christmas. Try using less sugar in your pies and cakes or substituting with honey or maple syrup. After the big feast, don’t forget to recycle cans, cartons, plastics and bottles and compost kitchen scraps. With your healthy and “green” holiday feast, you won’t feel so badly about overindulging! Happy Thanksgiving!